This is a maida (all purpose flour) free, oatmeal and whole wheat bread, suitable for breakfast as well as for soups and dips. I have not been baking bread for sometime as we eat very little bread and I keep making millet roti, buckwheat English muffins or kulcha in between. These roti, kulcha, English muffins etc are easy to bake freshly in limited numbers or as much as required. With breads I feel like baking a loaf and then it doesn't get used up most often, low consumption of breads to blame. 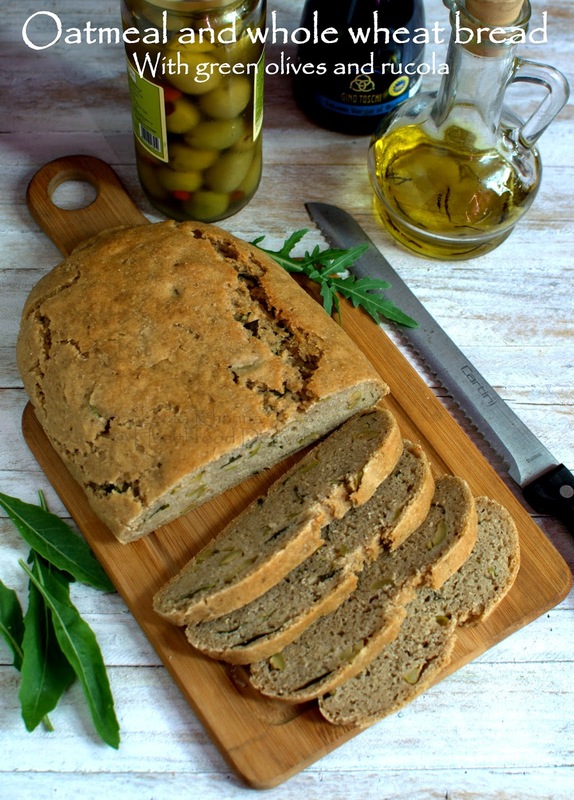 But then I saw this olives and rucola bread shared by Nandita and got tempted to bake one myself. Oatmeal bread was on my mind. Rucola has been growing well in the garden and I love the aroma every time I pluck the leaves. Not to mention the way it tastes in our salads and pesto. 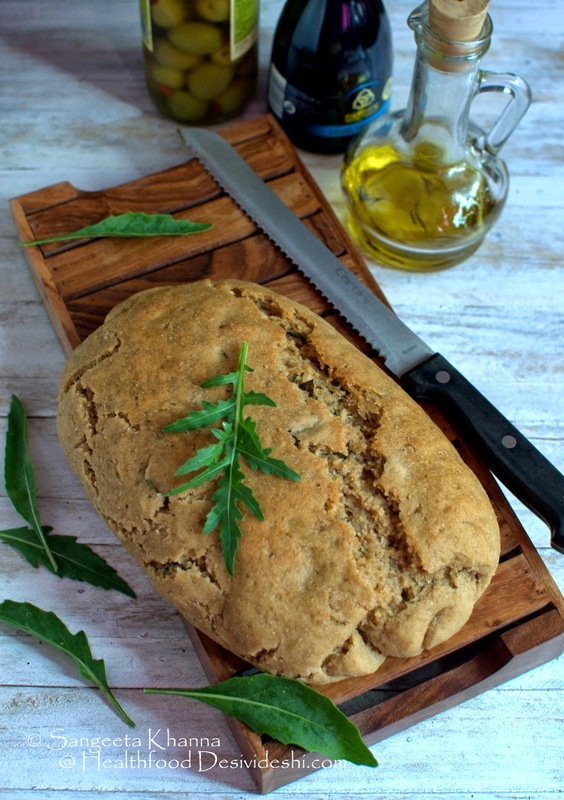 I thought it would taste good in a bread and I will get one more way to use the rucola that we are growing. And there it went into my bread. Only this time I decided to bake my favourite oatmeal bread. I had started experimenting with oatmeal bread years ago when I had bought my microwave. Yes I used to bake the breads in the microwave initially and it was my breads that made me get an oven for myself. This oatmeal bread uses cooked oatmeal to make the dough. This way the bread is really soft and rises as good as whole wheat bread, though the texture and crust gets a little different. This kind of artisan breads are great in a way that these are made to suit our own taste and nutritional expectations. We are using almost 50:50 ratio of oatmeal and whole wheat so you can imagine the 5% oats breads from the store will be different, not necessarily better tasting. I find this one better. You would know if you bake. Cook the oats with the water till just cooked. I did it in microwave for 3 minutes. Let it cool, keep covered. It looks really thick and gloppy at this stage, not like breakfast oatmeal. In the meanwhile dissolve sugar and salt in 1/4 cup of warm water and add the active dry yeast to it. Watch the yeast bloom (yes the yeast granules start getting bigger as they liven up) and add 1/4 cup atta. 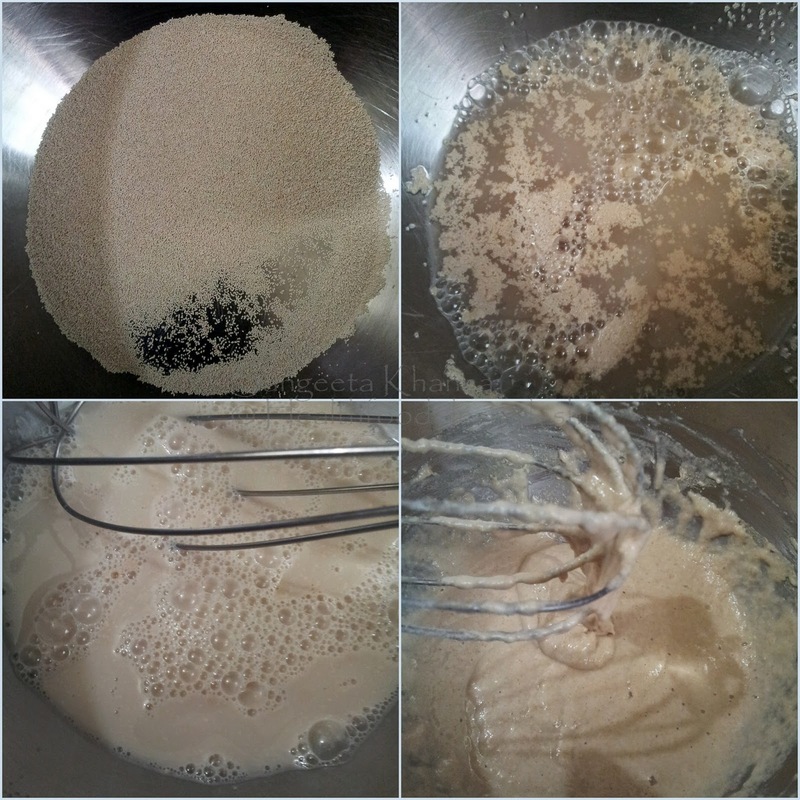 Whisk this mixture till the atta and yeast 'biga' gets sticky and strong. It starts resisting the whisking movements. This 'biga' can be prepared a day in advance and refrigerated. In north Indian summers it gets ready and tripled in just 30 minutes. 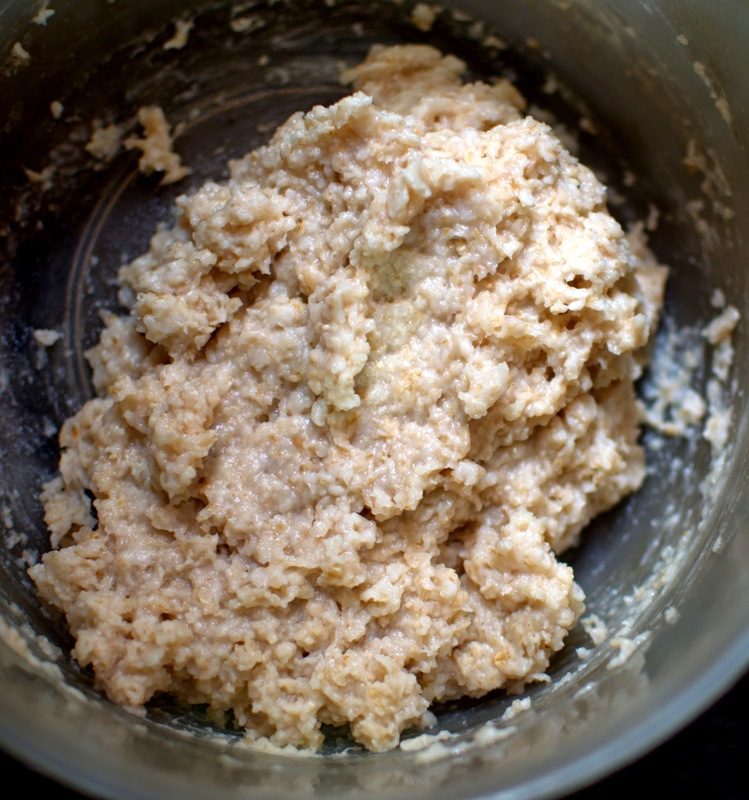 Mix this biga with the lukewarm cooked oatmeal and the remaining atta and knead using your hands (or machine) for a couple of minutes. 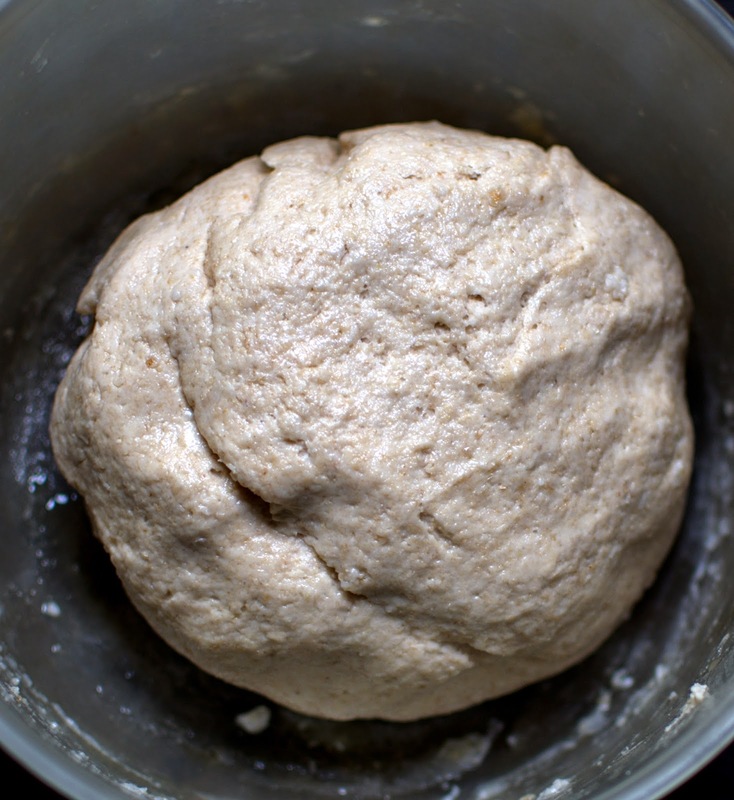 The dough looks really sticky and tacky at this stage. 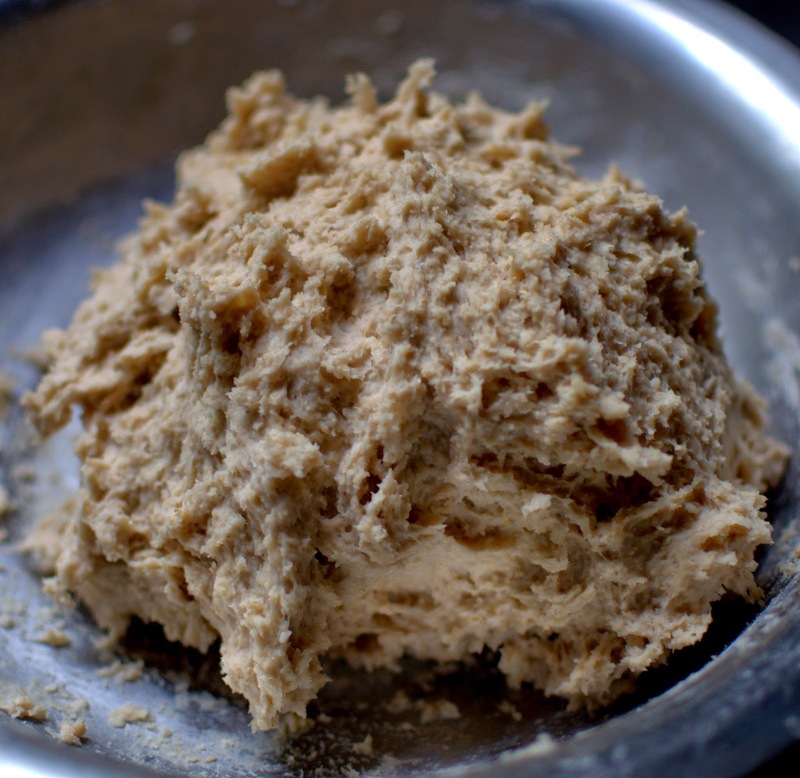 Scrape the sticky dough from your hands, apply oil and keep kneading for about 10 minutes. The dough will eventually get smooth. Wrap with cling film or cover with a plastic lid. Let it rest for about 2-3 hours in Indian summers or in a warm place till the dough doubles in volume. Now empty the dough on a working surface, flatten it using the palms into a rectangle and spread the olives and rucola. You might add some walnuts too. Roll the dough encasing the olives etc and flatten once again. Roll it up finally to make a loaf, pinching the ends and then place the loaf on the baking sheet, seam side down. Sprinkle dry flour over the loaf and cover with a cloth napkin. Let the loaf rise again till it almost doubles. I often wait for just 30 minutes, the loaf rising only about 10 % but it just results into a denser bread, softness and taste is not compromised. Bake in preheated oven at 210 C for 30-35 minutes. Brush the bread with oil and invert it on a wire rack to cool. Slice when completely cold. Serve as desired. I recommend warming up the whole wheat and oatmeal breads (especially my recipes that use only whole grain flours with bran) in microwave to make them soft when serving. These were great with extra virgin olive oil, the arugula pesto and good old plain salted butter. Olives tasted great in this bread. Rucola could have been more but more leaves would have altered the texture of the bread as this bread is already dense and moist. I could have added some rosemary for a change but we loved the bread as it is. Let me know when you try baking this bread. 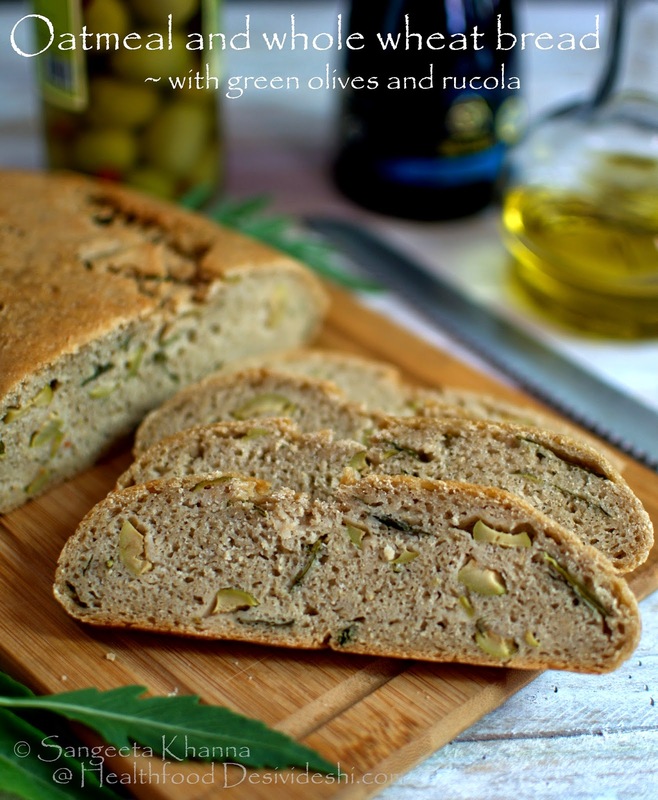 You can always skip adding the olives and rucola and bake the bread in a loaf tin. That is how I used to do earlier. Add any herbs if you wish or keep it plain. Earlier I used to bake only plain breads as eating the same flavour everyday was too monotonous for me. Now I make smaller loaves normally or share half of a loaf with someone. am on a bread baking spree and so making it this week. We eat - read the husband looovveeesss his bread!....so bread making it shall be!! Awesome way to make an oatmeal bread! The husband is a bread addict...so have run out of options...this one is so yummm looking ...will love to try this one....thanks for sharing! I had the same feeling as you after reading up Nandita's recipe! I am just waiting for my back to heal so I can try both your recipes. True that, warming up whole grain slices in the MW does make it so much softer and easier to chew! I'm definitely trying this recipe. How long does this bread stay well if stored at room temperature? Thanks. I also have another query. If I use instant yeast instead of dry yeast how much of it should I use?